I was so excited to finally get the chance to play. Obviously, having two older brothers whom I looked up to, I wanted to do what they were doing and, since they played tennis, I wanted to play tennis. Right from the beginning I fell in love with the sport. I was simply happy to be on a tennis court. All my father would talk about to his 3 sons was how amazing it would be to be a professional tennis player and soon that was all I talked about and wanted as well. It was more of a wild dream at the time but that dream would soon slowly move closer to being an extraordinary goal. Did his love and obsession of tennis somehow influence mine? Did he have it planned all along to "push" me to be a tennis player? Maybe, maybe not. It doesn't matter. What matters is that I wanted it just as much as he did. Throughout my childhood, I played many different sports. I played tons of soccer, basketball, ping pong, and would often go and play road hockey with Petr. I was especially good at soccer but gave it up completely at 12 years of age after receiving one too many injuries. The last straw for my dad was when I got elbowed in the face and received a black eye. Soccer had officially got in the way of my tennis and with that, it came to an end. In some ways my heart was broken because I often times had more desire to play soccer than tennis. During these key years and stages of development, our options were limited. Apart from the fact that we barely had any players to play with in our town, the winters were cold and snowy and the nearest indoor facility was 45 mins away. Every winter, we drove to the city of Kelowna to use indoor courts for an hour or so (sometimes more if courts were available), and then make the 45 minute trip back home in the dark and snowy roads. We did this almost every day for 6 years. This "tennis environment" was enough for the time being but my father realized that this would soon not be a sufficient place to chase a professional tennis dream, and had already begun saving money for a future plan. From a development standpoint, I was very fortunate to have two brothers that were also taking tennis seriously. Even though most of the hours I spent on the court were with my dad hitting tons and tons of balls, this gave me the opportunity to go and play with my siblings while my dad worked at the brewery. The days when he worked extra hours, my brothers and I would walk to the high school courts across the street and the three of us (sometimes only me and Petr) would compete. As you would expect from young and competitive siblings, several of our practices would end in fights or some sort of drama that we would then take to the house. But without this, and my brothers' presence, there would be no one for me to play with in my town and my development, even though I had my dad to play with, would have be stunted to some degree. 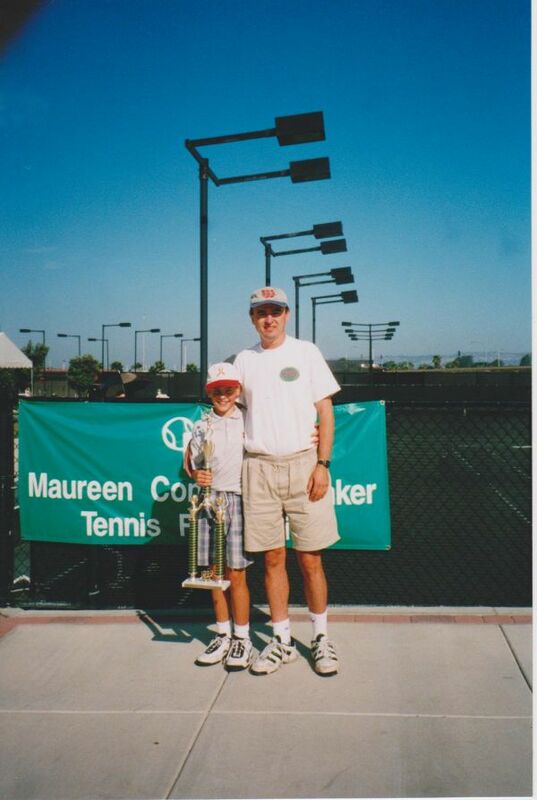 By the time I was 9 years old, I won the 9 and under Little Mo US Nationals held in San Diego (back then Canadians were able to play US national events). This was a monumental victory for us as the dream of being a professional tennis player became more serious, and our trips to Kelowna in the winter perhaps more frequent. So, with a US national title to encourage us, and being more of age, the time that we spent on court increased. We started thinking that maybe, just maybe, one day I could really be a professional tennis player; even if it was still more of a dream. We continued playing in our small town on cracked public high school courts and driving 45 mins in the winter to and from the only indoor tennis center in the area. My father continued working long hours at the brewery (but had quit his second job at the flour mill several years earlier), my mother continued to clean houses and taking care of us, and I continued playing regional and national tournaments where my results remained promising. My dad tirelessly worked on the precise development of my strokes and in the summer of 2002, turning 12 and still under his sole guidance, I was the best in the country and was considered one of the best in the world for my age. Seeing as I had reached such a high level, and that my father did not have coaching experience prior to coaching me and my brothers, he felt like it may be time to put me in someone else's hands. He was fearful of making the mistake of holding on to me for too long, and the thought that perhaps there was a better coach for me somewhere nearby, was worrying to him. Also, my brothers had left to college so I no longer had anyone to practice with in our town, making a bigger city with more players an attractive option. With these thoughts lodged in his mind, my father had begun discussions with a coach in Vancouver, who seemed to have a good reputation in the city. At the moment, the thoughts of making an environmental "upgrade" from our small town, were growing.